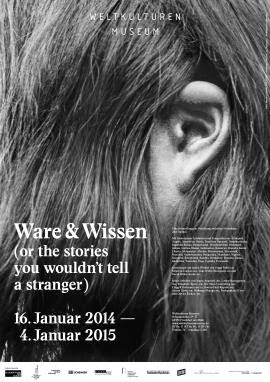 The exhibition “FOREIGN EXCHANGE (or the stories you wouldn’t tell a stranger)”, currently hosted in the Museum of World Cultures [Museum der Weltkulturen] in Frankfurt, can represent a perfect introduction to this new website dedicated to the encounter between anthropology, art and aesthetics within cultural heritage museums and contemporary art global scene. Likewise many other ethnological museums in the world, in fact, these one as well has gone under recent changes not only in its name – in order to propose itself as at the crossroads of equal relationships mediated by the objects – but also in its politics of display, that are now self-reflexive, inquisitive and finally higly challenging. Not only. This exhibition investigates and fosters the results of the same very issues anthropologists and ethnographic/ethnological museums curators face and deal with in their everyday work (asking themselves questions such as Ciraj Rassool’s one: “How do your turn an ethnographic museum that might once have been part of a natural history museum into a museum about a new nation?”), and does this by referring to artists in order to work with a deeply different perspective in the interpretation and the display of the ethnographic ojects that are now freely discussed and re-invented by these new participants to the work. This way, “objects from the collection and archival material are combined with new artistic research produced in the Labor by Peggy Buth, Minerva Cuevas, Luke Willis Thompson and David Weber-Krebs. 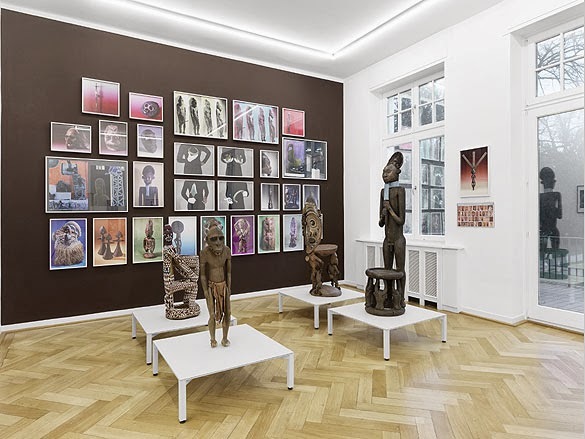 Additional works by Marie Angeletti, Lothar Baumgarten, Benedikte Bjerre, Rut Blees Luxemburg, Clegg & Guttmann, Rotimi Fani Kayode, Armin Linke, Otobong Nkanga, Pushpamala N. and Olivier Richon” (from the exhibition booklet 2013). We are therefore introduced to the matter in the entrance hall of the museum, where we already see the work by Otobong Nkanga echoing the ancient colonial photographies that will be part of the protagonists of the discourse in the following rooms. Surrounding it, many sentences about memory, culture, and the different elements that compose one’s identity, are written on the wall – resembling whispers, or murmured suggestions and inspirations. But – before these and in relation to this – a first room shows us a few ethnographic objects, completely decontextualised, and their photographic representation following on one side an almost anthropomorphic tendence and on the other side an artsy one. The sense is clear: the same object can assume different meanings and functions on the basis of the gaze turned on it, and the exhibition will open progressive revelations about this fact, and all the potential encounters/conflicts the ethnographic ojects are at the crossroads of. Therefore, more than a strategy to approach ‘the other’ (mission at the very core of ethnological museums) the display of ethnographic artefacts is here a way to explore and propose the audience considerations about us – white, Europeans, descendants of those who traveled to ‘exotic’ lands and bought, stole, exchanged objects to show or sell to the Western market. For this reason, on many of the walls in the different rooms we find questions about this relationship, and about the complete lack of rights, over their representations, by the ‘natives’ – measured, photographed, no matter their expressions could be read as uncertain and confused. 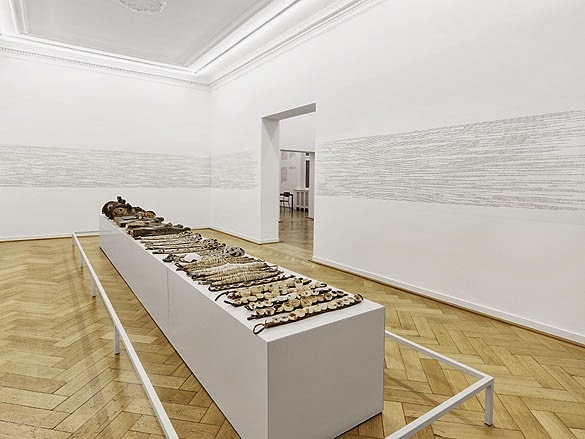 Another challenging issue – not only for ethnological museums, but also for us when collectors – relates to seriality: “Seriality is an important characteristics of ethnographic collections. Being part of a series heightens the autenticity of an individual artefact, because its own distinct features and the special mark of its marker – whose identity is often unknown – only emerge when we compare it with other, similar objects”. But the feeling collecting many examples of the same object could not lie as much in an academic mission, but rather in something like an obsession (for the accumulation of goods, their categorisation, the exert of some sort of control over them…) is fostered by the work/interpretation by the artist David Weber-Krebs, who assemblies objects from the Sepik-Expedition in 1961 with the thick writing on the sorrounding walls – in very small fonts – of the collection full inventory. And can be perceived as well by the amount of artefacts kept in the storehouse – here shown (in the original showcase, display cabinets, boards or drawers) in a very small portion of a “collection of 67,000 ethnographic artefacts from Oceania, Africa, South East Asia as well as from North, South and Central America […] complemented by a picture archive of some 120,000 historical and contemporary ethnographic photos and films” – as written in the website of the museum. More pictures can be seen on the website of the Weltkulturen Museum, as well as in the photo gallery related to the article Nabelschau im Weltkulturen Museum on the “Hessischer Rundfunk” website. An interesting article has been published on the “Taz” under the title Neue Fragen an alte Dinge. 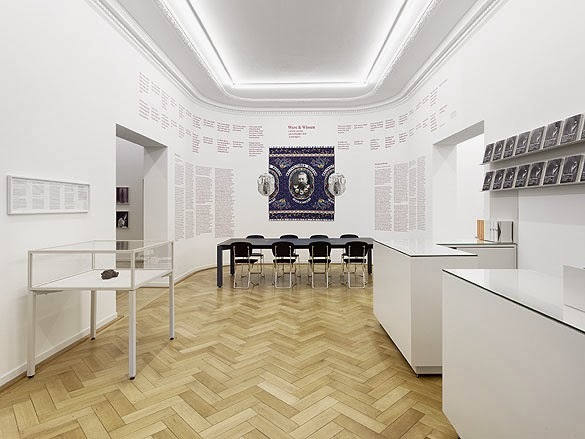 The collaboration between Weltkulturen Museum and artists is not a feature of the exhibition “FOREIGN EXCHANGE”: as written in the website of the museum, “the Weltkulturen Museum in Frankfurt is the first ethnographic institution in the German-speaking world to develop a new research lab on the borderline between advanced art practice and anthropology. In the Weltkulturen Labor, priceless objects, films, and photography from the Frankfurt collection are newly interpreted and prepare the ground for future exhibitions […] Selected artefacts from the museum’s collections will be re-evaluated here under optimum conditions. Visiting artists, scientists and academics will be invited to undertake research in the Labor, formulating new interpretations and creating original artworks based on the collection”. However, if you can’t engage directly or take the chance to visit the exhibition in person, you can still explore and add your insights, comments, links and paths in the Open Lab: a platform to explore, and hopefully to enrich in the future with new projects, exhibitions and works on the wavelenght ot the process started since a few years all over the world, where previous ethnological museums and current contemporary art are in a mutual dialogue to discuss the past in order to promote a fair and equal present and future for all us human beings.